After a conversation with a couple of online friends about a picture of a spider I posted to my Facebook page, I thought I would do an entry about some of the strange run-ins I have had with critters small and large over the years. Spud and I worked 2nd shift together at a small packaging company here in Grand Rapids. We would often leave right from work on Friday nights to go up north fishing or hunting, and so it was this particular weekend. We drove up to Haakwood State Forest Campground, which is just north of Wolverine, Michigan, and right on the Sturgeon River, which is where we planned to fish. When we pulled into the campground, we thought we were pretty darned lucky to get the spot we did. It was right on the water, we set the tent up on the grassy bank so close to the river that we could have fished from inside the tent if we had chosen to do so. It was the wee hours of the morning, so we used the headlights from my truck and a lantern to set the tent up, and get our sleeping bags ready, then turned in immediately, as it was getting close to dawn at that point. I woke up first, with that horrible feeling of not getting anywhere near enough sleep, but it was hot in the tent, very hot. As my eyes began to focus, I saw a spider on the bridge of my nose, staring me right in the eye with all eight, or however many eyes spiders have, of his eyes, I didn’t bother to count them all at that particular moment! That spider was quickly brushed away to who knows where, when I saw that the roof of the tent above me had a large number of spiders of all kinds hanging out right above my head! 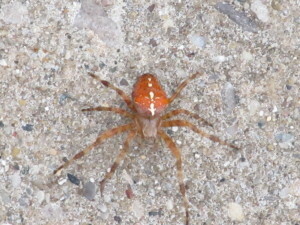 I snapped upright to the sitting position, and saw that the entire tent was filled with spiders! Big ones, small ones, brown ones, black ones, you name it, they were there! I grabbed one of my shoes and started in to killing as many as I could. Spud woke up to the sound of me whacking spiders and started to utter some profanity laced tirade about letting him sleep, when he saw the spiders too, and that profanity he had started turned into a sound I had never heard him make before, or after. He lost all interest in sleeping any longer, grabbed one of his shoes, and joined me in the mass killing of hundreds of innocent 8 legged creatures. They were everywhere, on the tent, on our sleeping bags, on our clothes we had left out, and on us! We swatted spiders until we no longer saw any movement, then began the task of removing the corpses. I think it took us about half an hour to get rid of all the little nasties that had decided to camp with us. Needless to say, while the coffee was still brewing that morning, we moved the tent to another spot, farther from the river after checking it out for spiders first! The next one is from a camping/fishing trip when Spud and I stayed at Round Lake Campground in the Pigeon River Country. We had fished all day, and we were sitting around the campfire in the dark, relaxing after dinner. It was a fine mid-spring evening, we were the only ones staying in the campground that night, so it was very quiet, you could hear the frogs in the lake and the night birds in the trees. Then there was a loud “whump!”, as the lid from the trashcan in the site next to us hit the ground, then the sounds of something rustling through the trash in the trashcan. We decided that we should go over and check it out to see if it was a bear, just in case, so one of us grabbed the lantern and we started over there. We walked slowly, so if it had been a bear, we wouldn’t come up on it too quickly, but when we got to the trashcan, there was nothing there. The lid was on the ground along with some of the trash, so we cleaned it up, replaced the lid, and went back to our fire. We thought that it would be the end of it, but we had only been back to our fire a few minutes when we heard the “whump!” of the lid hitting the ground again. This time we headed over there a little more quickly, looking for whatever critter it was that was raiding the trashcan, but again, we saw nothing. Again we cleaned it up and replaced the lid, and back to our campfire we went. We had barely sat back down, when “whump!”, the lid hit the ground again! This time I grabbed the heavy-duty 3 cell flashlight from my truck on the way over, but we never saw anything, no eyes shimmering in the lights, no shadowy figure waddling off into the darkness, nothing! Spud and I weren’t easily spooked, but this was starting to spook us. It was only 40 or 50 feet from our site to the trashcan, it didn’t take us long to get there. We cleaned up the mess again, replaced the lid, and this time, we looked for tracks that may have explained what was going on, but there were no tracks. Now we were really getting spooked, as the dirt there was sandy, and any critter would have left some kind of tracks, but the only ones there were our’s from our previous trips over there. This time we didn’t sit down after we got back to the fire, we stood there discussing what type of animal could get there that quickly, knock the heavy lid off a trashcan that tall, then disappear before we could get there and sure enough, there was that “whump!” yet again! This time we practically ran over there, but yet again, we saw nothing, and could find no tracks! At some point that night, Spud asked me if I knew if any one had drowned in the lake, I knew what he was thinking, and to tell you the truth, I was thinking the same thing. We made that trip back and forth a half a dozen times or so, and we never did see any animal, never did find any kind of track or sign that would have told us what was raiding the trashcan. It stopped as suddenly as it started, we sat there waiting to hear that “whump!” again, but it just quit happening. When we got up the next day, none of the trash cans in the campground had been disturbed overnight. That seems kind of strange too. If an animal was so intent on raiding a trashcan, then why weren’t any of the others in the campground disturbed, other than the one near us, and while we were awake? I have had my share of run-ins with snakes over the years as well, usually while walking. Snakes don’t bother me, they startle me more than anything. It has happened many times while walking that about the time I am about to put my foot down for my next step that I hear a rustling sound, look down, and see a snake where I was about to step. I end up doing a weird dance to avoid stepping on them, then they slither off to safety. I have seen them swimming many times when I have been fishing, even had one join me in my boat one time. I persuaded him to leave the boat, not because I am afraid of snakes, but I really didn’t want one living in my boat, that’s a bit too much. I see them a lot will kayaking, just hanging out on limbs over the water waiting for a meal to come their way. I have never had one drop into the water near me, but others I have been kayaking with have. I think the snake that startled me the most was one hanging out on the end of a branch in a pine tree. I was reaching for the branch to move it out of the way, when the snake moved, and I could see it. I never thought of snakes in pines before, which is why it startled me as much as it did. Larger critters can startle me too. One time I was sitting against my favorite stump while deer hunting. It was getting late in the morning when it sounded like some one walking up behind me. I thought it was one of the others in the hunting party coming to get me for lunch. I turned around and was face to face with a doe, less than 3 feet from me. I know I jumped as much as I could while sitting, but the reaction of the deer was priceless! She shot straight up in the air about 3 feet, and was doing all sorts of contortions on the way back down, trying to get turned, her legs were already running before she hit the ground! She was trying too hard, and when her hooves did hit the ground, her legs went out from underneath her and she hit the ground with a loud thump. She jumped right back up, and was off like a shot this time. I didn’t have a doe permit, and it is just as well, as I was laughing too hard by then to have gotten a shot off. Another time when I was out walking, I walked up on a young doe sleeping against a fence. When she woke up, she tried to jump the fence, but crashed into it instead, landing in a heap on the ground. She got up, tried again, and the same thing happened, she crashed into the fence and landed in a heap. She tried again, with the same result. I felt sorry for her, you could sense her panic, and I was afraid she was going to injure herself. Finally, the fourth time, she had enough sense to back up a step or two, then make the leap, and she cleared the fence and was gone. I can’t vouch for this one, Doug told me this story, and Doug was known to stretch the truth at times, but I believed this one. He was fishing the north branch of the Au Sable, above the famous Sheep Ranch. He had been fishing all morning when he came to a large logjam across the river. He decided it would be a good spot for a break, so he sat down on the largest of the logs, with his feet dangling in the water. He ate his lunch, then leaned back against the logs, and snoozed for a while. He said a noise behind him woke him up, and he thought it was another fisherman trying to cross the logjam. He sat up and turned around, but it wasn’t another fisherman, it was a black bear that was using the logjam to cross the river! Doug said he just took off running downstream as fast as he could, and he could hear splashing behind him, he thought the bear was chasing him. It finally dawned on him the splashing he was hearing was getting further away, so he slowed down to take a look. There was the bear running upstream as fast as it could go to get away from Doug, which was a good thing, because it was then that Doug realized he had forgotten his fly rod and fishing vest on the logjam. Once the bear was out of sight, he went back for his stuff. Then, there are leeches, one of the most vile and disgusting forms of life that I know of, I hate them! I’ve had a few run-ins with them over the years, mostly when I was a kid. One of my uncles had a cottage on a lake less than five miles from our parent’s house, so my brother, cousin, and I would spend our summers in and on the lake, swimming and fishing. Something we always did after we got out of the water was to do a leech check, and every so often we would find one had attached itself to us and was making a meal of our blood. If we found one, we would scream like a girl, and go running towards the adults yelling “Get’em off me, get’em off me!”. It was usually my aunt who removed them, by touching the lit end of a cigarette to them. They would writhe around in pain for a few seconds, then fall off. A couple of times when we went up to Canada to visit my dad’s friend John, who ran a fishing camp there during the summer, we would see schools of leeches swimming in the lakes up there. If the cold water wasn’t enough to change your mind about swimming, seeing the schools of leeches swimming past you while you stood on the dock were. And there were schools of them, from a half a dozen to a dozen at a time, undulating through the water in search of their next victim. That was nothing compared to happened to me as an adult one time. Spud, a couple of his brothers, and I were fishing the Rouge River below the old Childsdale Dam. It was the middle of summer, too hot for waders, so I rolled up my pant legs and waded barefoot. I had seen leeches in the Rouge before, in slow muddy backwaters, a couple of times after wading through such an area I would find them attached to my waders. That didn’t bother me, they were on my waders, not me, and they would dry up and fall off to die, a deserving end as far as I am concerned. The river below the dam is fast and rocky, so the thought there could be leeches there never entered my mind. When I got out of the river, my lower legs were covered with little leeches, dozens of them! Of course my first instinct was to scream like a girl, and go running towards some adult yelling “Get’em off me, get’em off me!”, but, I didn’t think that course of action would do much to bolster the macho image I wanted to project at the time. I was trying to remain cool and calm, something made more difficult by the reaction Spud and his brothers had to my predicament. I sat down on a convenient rock, lit up a smoke, and started trying to burn the nasties off one by one. These weren’t the big juicy leeches you normally see, these were a little over an inch long, and less than an eighth of an inch in diameter, and there were lots of them, they looked more like oversized hairs on my leg than leeches. I was burning myself every time I tried burning one of them, and my cigarette would go out after just two or three of them would fall off. Still wanting to scream like a girl, and go running towards an adult yelling “Get’em off me, get’em off me!”, I decided to check the trash can there on the bank, hoping to find something to help me get rid of the leeches. I lucked out and found a small container of salt, the kind guys used to carry in their lunch boxes. I sat bach down on the rock and sprinkled the salt on them, and they began to fall off one by one. Of course the salt stung me at every point there had been a leech, but it wasn’t as bad as the cigarette burns I had been giving myself trying to get rid of the leeches that way. Needless to say, when I got home that day, I grabbed a couple of the canisters that 35 mm film comes in and filled them with salt, and put them in my fishing vest in case something like that ever happened again. I also carry a couple in my kayaking bag as well. At least I am prepared now, even though I know my first reaction would still be to want to scream like a girl, and go running towards the adults yelling “Get’em off me, get’em off me!”, some things never change. I titled this The DeLorme Challenge for a reason, but, I could have easily titled it as one of the following. OK, the DeLorme Challenge part. Last Christmas I gifted myself a handheld GPS unit built by DeLorme. It is one of the best purchases I have made for reasons I’ll explain in another blog, but here’s the reason for this blog. DeLorme is on Facebook, and through that I learned that they have a drawing each month for a $100 gift card you can use to purchase their products. All you have to do to be entered in the drawing is complete the challenge they set out for you. Never being one to turn down free stuff, I thought I would give it a shot. The challenge for November was straight forward enough, hike a trail with in 20 miles of your home that you have never walked before. Take some pictures, and post a track of your path along with some waypoints that you have entered on your GPS to their Facebook page, and you are entered for the drawing. The object is to get people out-of-doors more, and familiar with their GPS unit. It is really a cool thing, in my opinion, I have looked at what the other people have posted, and I am enjoying seeing other parts of the country, and I am learning more about the features of the units. I liked the premise of this challenge, it fits in well with what I was doing anyway, finding places closer to home to walk. It dawned on me this summer that what I had been doing, driving 40, 50, or more miles to walk a few miles over a couple of hours was extremely wasteful. That’s one of my favorite quotes, and I try to live my life that way. We Americans are good at complaining about problems, not so good when it comes to examining our own lives’ and seeing how we contribute to those problems. We complain about the price of gas and yell that “Big Oil” is ripping us off, yet we continue to hop into our oversized SUV’s and drive 85 MPH as if there was an unlimited supply of oil. There isn’t, we will run out someday! I had already gone from driving full-sized trucks to a compact truck, then a Subaru in order to reduce my consumption of oil. I now drive a mid-sized SUV for reasons I won’t go into here, but it was not my first choice of vehicles, it fit my life and budget at the time I bought it, and if I could, I would dump it in a heartbeat for a more efficient vehicle. I don’t want this blog to become too political, but there are government officials who are considering legislation to control what kinds of vehicles the public may be able to purchase and to limit our driving by imposing special taxes on people who drive more than what these officials believe is necessary. It shouldn’t take a law or laws, we have too many of them already! Mark Twain famously said, ‘Everybody complains about the weather but nobody does anything about it.” It is time to put up or shut up people, if you think the price of gas is too high, stop using as much, it is that simple! Since I am typically walking or kayaking somewhere every weekend, I thought the hardest part for me would be to find a new trail with in 20 miles of where I live. That part I was wrong about, I just hadn’t done enough research yet. I have been walking around the neighborhood for the last couple months, and while I was outdoors and got some exercise, walking the roads in my area is dangerous with the way people drive, and walking subdivisions is boring. I went to the mapping program that came with my GPS unit and drew a 20 mile circle around my apartment and was surprised that a segment of the North Country Trail is right on the edge of that circle. I also found dozens of other possibilities as well. Looking at the map, it dawned on me that I could walk a segment of the North Country Trail, then kayak back down the Flat River to my vehicle, that sounded like a great plan! I could drop my kayak off at an access site in Fallasburg Park, lock it to a tree, then drive to a point where I could take the kayak out when I got back, yet was close to the NCT. I planned to do that 2 weekends ago, as I write this, but I had to postpone it the first time I was going to do it. Instead, I walked another set of trails I had found even nearer to my home. Palmer Park is only a couple of miles away, it is one of Kent County’s parks, and they teamed with the city of Wyoming to connect the trails in Palmer Park with a system of trails the city maintains along Buck Creek. It was a good day overall, but there were some high points and some low points. Palmer Park is surprisingly nice, a good set of trails, and it’s quiet this time of year. But, for some reason, the county closes it the end of September, or tries to. The gates are locked so that you can’t drive in and park, you have to park along the road and squeeze past the gates. I talked to a couple I met in the park, and they told me that at one time that the county had it fenced so that you couldn’t even squeeze past the gates. They were told the county did that so no one could play the golf course that is in the park for free. I used to know a couple of people who grew up in the area, and they had told me they used to sneak into the park and play some of the course that is out of sight of the clubhouse when they were kids, so I guess that it does happen. I really can’t see that as being a huge problem in the fall though, and it is too nice of a park to be closed almost half the year. Enough people complained to county commission that the fencing was taken down to allow some access, but it seems like a waste, especially when you walk through the park and see that the county is paying to have it maintained even when it is supposedly closed, that makes no sense at all, at least not to me. It was a nice walk through the park, and I found other trails with in the park that I am going to go back another time and walk, but for that day, I walked all the way through the park until I came to the trail that connects to the Buck Creek trail in Wyoming. That was a nice trail too, except you are basically walking through people’s backyards. There’s a fence of course, but the trail runs right along the back edge of the property owners’ back lot lines. I saw a lot more wildlife than I expected, I even had 3 deer walking parallel to me for almost a quarter of a mile. I couldn’t get a good picture of them though, they wouldn’t step into a clearing. I think the wildlife uses the corridor along the creek to move from one area to another, and between the creek and a couple of ponds, there is a lot to see. But, it isn’t quiet, that’s for sure. You can overhear people’s conversations as you walk along the trail, and since it is fall, there were lots of leaf blowers at work. I hate leaf blowers, I always have since the first time I heard one. I don’t know why, but the sound they emit irritates me to no end. I would rather hear a dentist’s drill than listen to a leaf blower! Seeing them in action makes it even worse, talk about a waste of oil! That’s the way it was when I walked the Buck Creek trail, I could see home owners blowing leaves around and around and around their small yards. They could have used a rake and been done in half the time and not burned a drop of gas doing so. They use leaf blowers here at the apartment complex too, they are about the only thing I have complained about. Twice a week in the fall, they go around and blow the leaves off the grass and back into the woods. By the time they get around the next corner, the wind is blowing the leaves right back onto the grass, so the cycle repeats itself over and over. I have suggested that they use vacuum mulchers instead, which do use gas and are not the most pleasant devices to listen to, but, at least then the leaves are disposed of once and for all and can be put to good use. They have taken my suggestion “under advisement”…LOL. But overall, it was a very nice day, and I will definitely walk the same trails again. In fact, I am really looking forward to walking it in the spring to see if there will be as many wildflowers as I think there will be. That leads us to this past weekend, I was able to do the North Country Trail/kayaking trip. I dropped my kayak off in Fallasburg park, near where the NCT exits the park. Fallasburg Park is another one run by Kent County. Who ever is in charge of the parks must have their head up their rear end. The best access to the river is blocked off, so you either have to carry your boat and gear a hundred yards or more to get to the river, or do what I did. I parked next to the bridge and unloaded there and slid my kayak down the embankment to the river. I locked it to a tree so it would be there when I got back, then headed to where I was going to pull out of the river when I was finished. That wasn’t the greatest spot in the world either, it turned out to be easier than it looked, so it worked out OK. It was about a half a mile walk from there to the NCT trailhead, and that’s where things got darn right ugly. The residents in the area, or who knows who, are using the trailheads as dumping grounds for all sorts of nasty stuff. There were a couple of deer carcasses, bags of household trash that animals had scattered all over, and junk everywhere for the first little bit of the trail. Come on people! Quit spoiling things for the rest of us! The smell of rotting deer and garbage was nasty, and wasn’t at all pleasant to look at either. The good thing is that almost as soon as you are out of the parking area, the trail is quite beautiful! You start off with a slow climb to the top of the high bluffs overlooking the Flat River, then go down the other side to a low area along the river. It is very nice, all wooded, with a few very large trees, and a good mix of a little of everything. For a lot of the first part of the trail, there was a flock of tweety birds going the same way I was, and they put me back into a good mood after seeing the trash piles there at the trailhead. Tweety birds are what I call the loose flocks of chickadees, titmice, nuthatches and woodpeckers that stay together by constantly chirping away, so the rest of the flock know where they all are. They always put me in a good mood, they are happy birds, and their happiness rubs off on me. It was an uneventful walk, other than hearing a few leaf blowers, occasional gun shots as hunters sighted in the rifles for deer season, and the constant drone of traffic off in the distance. It isn’t a wilderness by any means, but it is a very nice walk for as close to town as it is. I found out from talking to one of the few people I saw along the way that I hadn’t chosen the best part of the trail, but it is still one that I will do again, and I am looking forward to doing the segment that they suggested as well. The kayaking leg started off almost as badly as the walking leg did. The first couple of hundreds yards of the Flat River was pretty much a rock garden, without enough water to paddle, but too much to walk easily. After that, I hit deeper water and had a very pleasant paddle back to my vehicle. Except for all the houses along the way, it is a pretty stretch of river, and as I neared the pond behind the dam, I watched a bald eagle soaring over the river valley, looking for fish. I had just read a couple of weeks ago that they had released a young bald eagle that had been injured in the area, I don’t know if that is the one I saw or not. But, it was pretty cool watching it soar over the river valley. I almost forgot one of the other highlights of the trip, the covered bridge over the Flat River. I hadn’t been there since I was a kid, and it was pretty cool to kayak under it, as well as the great view of the bridge that you have as you approach it on the river. 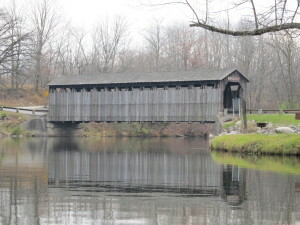 The bridge was built in 1871 for a cost of $1,500 using white pine timbers and is still used today, how cool is that? Even though I am an old dog, I learned a few new tricks thanks to the Challenge, one is that suburban walking can offer a lot more than I thought if you take the time to explore the options that there are these days. I also learned that walking first, then kayaking is a lot better than what I have done in the past, where I have kayaked a section of river, then walked back to my vehicle. Here I have been doing it backwards for all these years. I still hate leaf blowers though. Fishes are the craziest critters! Fishes are the craziest critters, except for those of us who fish for them, we are even crazier, but it is the fish that make us that way! We’ve all had them, any one who fishes has had those days when the fish refuse to bite no matter what we put in front of them or how we present it to them. Even worse are those times when you hit the river in the middle of a hatch, with trout feeding all around you, and they all refuse every fly you try. Then there are the days when the fish seem to line up waiting to commit suicide by devouring whatever hooked monstrosity you throw at them. I have read dozens of books on fishing, and there are hundreds more out there that I haven’t gotten around to reading yet, and no one has it figured out from what I can tell, at least no one has shared that secret with me. We tell ourselves that is what makes fishing fun, the challenge, yeah, right. What makes fishing fun is catching fish! Being the curious type, I do enjoy trying to figure out why fish feed when they do, and why they don’t when they don’t, but catching them is why I fish, trying to figure them out is why I think and write about fishing. For me, as with most fishermen I suspect, it started back when I was a kid fishing with worms for panfish. Most of the time you could catch fish, but there were days when even small panfish refuse to bite. Even worse is when you can see them refusing to bite. If you’ve fished, you know what I’m talking about. When you can see a bluegill or sunfish hanging out under a lily pad, and you drop a nice big, fat, juicy worm right in front of its nose, and it doesn’t even move. Maybe worse is when they slowly glide over and nudge the worm with their snout, but they never open their mouth, as if it were super glued shut or something. I have had that happen with nearly every species of game fish I have fished for. Like the 15 inch brook trout hanging under a log on the Sturgeon River, looking like it was in a feeding lane, only to have it refuse everything I drifted past it. Or bass back in the weeds in the bayous of the Grand River, that refuse everything I’ve tried. In fact, except for salmon and steelhead, I have never had much success fishing for fish I could see. Salmon and steelhead are a completely different story all together anyway, they aren’t actively feeding at any time they are in a river, you have to make them mad to get them to hit. Well, even that isn’t true all the time. I remember one female steelhead in particular, I made my first cast and missed the mark I was trying for in order to get a good drift right in front of her nose. Not wanting to spook her off, I was working my spinner as to have it go nowhere near her, but she spotted it, shot over to it and hit it like a freight train. Just one of those rare deals I suppose, as I am used to making dozens, maybe hundreds of drifts right in front of the nose of a steelhead or salmon to get it to strike. She was a memorable fish for another reason as well, she’s the one that taught Tom to never try to net a green steelhead, that is, one that hasn’t been played out. She hit that spinner and took off downstream like a Ferrari, in one of those runs only steelhead and Atlantic salmon can make. Where the line cutting through the water leaves a wake, you can hear the vibrations from the line as it cuts through the water, and the drag of the reel screams as you hold on for dear life. Luckily, she stopped in the next pool downstream, and layed up there while I worked my way down below her. When you’re playing big fish on light line, you try to stay below the fish so they have to fight you and the current, if you let them stay below you, they usually win. I could feel her shaking her head, trying to dislodge my spinner from her jaw as I handed Tom my net. He hadn’t been steelheading before, so I told him I would tell him what to do when the time came. I pulled back on her as hard as I dared to trying to get her to run upstream to tire herself out, it worked, sort of. She took off upstream the same way she had come down, with the line and drag singing that song you love to hear if you’re a steelheader. She got as far upstream as the riffle above where I had hooked her, but she wanted no part of that shallow water, so she turned around and came back at us faster than ever! She was headed right for Tom, I yelled at him to get out of the way, but there was no time at the rate that fish was going, I tried to turn her, but I couldn’t reel fast enough to get any pressure on her. She decided that going between Tom’s legs was her best way of getting free, and at the last second, he stuck the net down in front of her. She hit it doing about 150 MPH, and she didn’t stop when she was in the net! Poor Tom was stumbling backward through the rocks, trying desperately to stay on his feet as she drove him downstream about 10 feet or so. I was afraid she was going to knock him over into that cold water, and I was deciding if I would save him, or the fish, but he finally managed to pull her up out of the water. He hoisted her as far out of the water as he could, as if the more distance there was between her and the water, the safer he was going to be, and as the look on his face changed from panic to total triumph, he said “I’m never going to do that again!”. I told him “Good Job”, I didn’t have the heart to tell him I was considering letting him drown in order to land the fish, but, steelheading is like that. Back to fishes feeding, just as curious, but a lot less frustrating than fish refusing to feed, are fish that continue to feed even after their gullets are full. There have been countless times that after I have landed a trout, and that when I am taking the hook out of its lip, I can look down their throats and see a slimy, brown/black mass of insect corpses slowly being converted into trout meat. Quite a disgusting sight actually, especially if the phrase “you are what you eat” happens to pop into your head at the time. I have never landed a brook trout like that, I am not a biologist, and I don’t play one on TV, but their metabolism must be different that of brown’s or rainbow’s. That may explain why they are easier to catch, they feed more often, but don’t feed as much at any one time. Maybe I’ve just never caught a brookie that was over stuffed. There have also been numerous bass that I have landed, that when I am removing the hook, I can see the tails of bait fish filling their gullets. Brown trout have a reputation for being finicky eaters, I’m not sure I hold that view. From what I see, they eat like pigs until that can’t hold any more, and then they have to wait until they can digest what they have already eaten before they can eat again. One May, Doug and I went trolling on Lake Michigan near Leland. I hooked what turned out to be a nice Brown Trout. I was in the front of the boat, Doug was in the rear, so as I was bringing it up to the boat, it went past him as I was getting it into position for him to net. He said, “Look at that! Its mouth is full of alewifes”. Sure enough, I looked over the side and could see tails of alewifes sticking out of the brown’s mouth. About that time, the brown coughed, or puked, or what ever fish do when they have eaten too much, and about a half a dozed alewifes received a pardon from their death sentence and swam off to feed another trout another day. When we had the fish safely in the boat, we both looked, and the gullet of that fish was packed, and I mean packed, with alewifes, and remember, it had coughed up even more as we were landing it. That fish probably had close to a pound of food in it when I caught it, and it was a 5 to 6 pound trout. That’s a lot of food at one time! Oh, and I should warn you, fish digestion doesn’t smell any better than our digestion, so you may not want to hold a fish right under your nose as you look down its throat. Finicky is not the word that comes to mind when you see a brown trout literally stuffed to the gills, and beyond. I said I have never caught a brook trout in that condition, however, back when I still used bait on occasion, I found a rather unique way of landing brookies. I would use an entire crawler, and run the hook through it just one time near the front, leaving lots of good trout food to dangle in the current. You could feel the brookies grab the crawler and start munching their way towards the front. When I would feel them pause, I knew they had as much of it in them as they could get, then I would pull them in. They seldom got to the hook, but, they didn’t want to let go of the gourmet boneless crawler that must have tasted so good to them, to the point where I could land them, pull the crawler back out of them, and reuse it many times, all without having to remove the hook from the fish. Spud didn’t believe me when I told him how I fished for brookies, until I showed him, then he started fishing them the same way. Timing is the key to it, you let the crawler drift back into the root tangles where brookies hide, and wait. You feel a tap, then munch, munch, munch, and a pause. If you feel another munch after the pause, you’ll have a gut hooked trout, and a gut hooked trout is a dead trout. When you feel the pause, you yank them out of the water before they have a chance to spit the crawler back out. If you try to play them, you’ll lose them, you feel the pause and rip them out of the water, works like a charm. Of course the larger brookies, the ones you want to keep, will make it to the hook. I guess brookies will feed to the point where they are more than full, since I was landing them with as much crawler still to be eaten as they were able to get into their stomachs. Over the years I have tried to figure out what the keys were that turned fish on, and turned them off. I have learned a lot of the off keys, having to do with the time of day and the weather, but I still have no idea what turns fish on as far as when they are going to start feeding. Some of the off keys are so obvious it is hard to miss them. For example, one morning Spud and I were fishing the Sturgeon, and doing pretty well, catching a lot of both brown and brook trout. It was raining lightly that morning, and as long as it rained we caught fish after fish. When the rain let up, the fishing slowed down, and when the sun came out, we never had another hit. I have always had good luck fishing in the rain, as long as it isn’t a downpour. That holds for trout, bass, and panfish. Other keys are more subtle. Often I’ll be fishing in the spring or fall, fishing in the afternoon, going on evening. Evenings are great in the summer, but during the spring and fall, you’ll often notice a chilly breeze comes up just before evening. I have never done well after I feel that chilly breeze. Chilly is the best way to describe it, it isn’t cold, and even if there has been a breeze all day, it will feel differently than it has, and if you are really observant, you’ll notice a change to the scent in the air as well. Often I am not ready to quit fishing even when I feel that chilly breeze and continue on, also hoping to prove that I am wrong, and that it doesn’t end the fishing, but it always has. The same holds true for chilly mornings, if there is a mist coming off the water, I never do well, in the spring and fall that is. In the summer, that can be a good time to be on the water. But what the switches are that turn fish on is beyond me. I don’t know how many times I have been fishing all morning when fishing was supposed to be good and not caught a thing, when, about the time you would normally quit, the fish start feeding as if some one threw a switch. 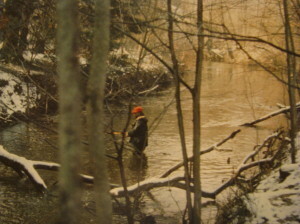 One day Spud and I were up in the Pigeon River Country, we had fished hard all day with nothing to show for it. We had fished different rivers, and different places on those rivers, with no luck at all. Finally, I suggested that we move to one of the “secret honey holes” that I knew of. It seems every fisherman knows a few places that seem to always produce fish, the secret honey hole. Anyway, Spud and I were wading up towards the one I had in mind, and we could hear a fish jump every once in a while. We figured it was a sucker, which are known for that. When we got to the secret honey hole, I told Spud where to cast, and he was instantly on to a good fish, which turned out to be a 2 1/2 to 3 pound brown. Once he had landed it and gutted it, we found 3 dragon flies in that brown’s stomach. That was the fish we had heard jumping, that brown was jumping out of the water catching dragon flies out of the air! I had never heard of that before or since, browns feeding on dragon flies, and jumping out of the water for food is unheard of when it comes to large browns like that. And, there was nothing in that fish’s stomach except for the 3 dragon flies, so it must have been some time since it had been feeding. Brown trout are supposed to be lazy feeders, “quietly sipping mayflies from the surface” according to all the books and magazines I have read. This fish hadn’t read all the books and magazines I guess, he didn’t know he wasn’t supposed to be eating dragon flies either. Many things to learn from that story, one is that trout must have a pretty good sense of vision as far as what is above the surface of the water they live in, in order for that fish to catch dragon flies out of the air. And, no one that I know of has ever been able to explain why fish will suddenly begin feeding on anything they can find when the mood strikes them. I don’t know the answer, if I did, I would have had a book published, made millions of dollars from it, and blown it all on more fishing gear by now. I have to say a few words about the solar/lunar guides that are supposed to tell you the best time to hunt or fish, and those few words are, the guides are wrong. It would seem to make sense, given that so much of animal behavior is driven by the sun, moon, tides, etc, but as soon as the guides started coming into vogue, I noticed a major flaw, they’re all different. The ones in magazine “A” are completely different from the ones published in magazine “B”, and they are both different from the ones published in the newspaper. I know, I need a solar/lunar guide guide to tell me which one to go by that day. My GPS unit has that feature, and I don’t think it has ever been right yet. If you do a web search on solar lunar tables, you’ll come up with a lot of page listings from the publishers telling you their guide is right and all the others are wrong, which tells me that none of them are reliable. I have saved the most frustrating situation in fishing for last, and that is when the fish are feeding, but not on what you’re offering. This happens mostly to those of us who fish for trout. You’ll be out there on a river, minding your own business, catching a fish every now and then, when suddenly the river seems to be alive with feeding fish. It is like the DNR truck just dumped a couple thousand fish in the river, and they’re all starved. The fly you have been using doesn’t draw any hits, so you look down on the water and see a reddish-brown may fly drift past you. You dig around in your flyboxes and come up with a reddish-brown may fly pattern, thinking that you’re going to clean up on the fish, but you get no hits what so ever. You’re getting slightly annoyed, when you swear you see the fish you’re fishing to take a small white caddis off the surface. Aha, they’re feeding on caddis, so you dig through your flyboxes and come up with a small white caddis pattern. “Now I’ve got you”, you think as you prepare to cast, only to find out a hundred casts later, that the fish still have you. You’re starting to get really annoyed by now, but about that time, you see a small stonefly flutter past you. Aha, once more you think, they’re feeding on stonefly nymphs on the way to the surface. So you dig through your flyboxes and dig out a small stonefly nymph pattern, thinking to yourself, “Now I have them for sure!”. Wrong, they still have you, and by now you’re almost frothing at the mouth. There’s a 5 pound brown feeding over by the stump, and another almost as big by the rock over there. You tell yourself to stay cool, stay calm, and ask yourself, “What would (insert name of favorite fishing expert here) do?”. That’s it! He’d get out his nymph seine and check to see what insects are in the water. So that’s what you do, and sure enough, there’s a nymph that you’re not familiar with, so you get your hatch guide out of one of the pockets of your fishing vest to identify what it is. There it is, it is a piscatoria foolia, what ever that is. The next thing is, do you have a piscatoria foolia buried in one of your flyboxes somewhere? “Today’s your lucky day” you think to yourself as you find that you have one, in the section of a flybox reserved for flies you got as part of an assortment, but thought you would never use. You tie it on quickly, too quickly, the line snaps as you pull the knot up tight. You tell yourself to stay calm yet again, and the second knot holds. You pull some line through the rod guides so you’ll be able to cast, and toss the fly into the water in front of you, to give it time to soak up some water so that you will get a good drift when you do make the cast. It is getting dark, and you don’t have a lot of time left, so you’ll have to make every cast count. As you survey the situation, you feel a tug on the line, a little brown has taken your fly! Woo Hoo! That means you finally have the right fly on. You pull in the little brown……..
Now dear readers, one of two scenarios play out from here, neither good for the mental well-being of the poor fisherman in this story…..
You carefully remove the hook from the little brown’s mouth, look up to pick a spot to cast to, you see it is now almost dark, and there’s not a feeding fish to be seen anywhere. You make a few casts just to be sure, but all the fish have finished gorging themselves on the real piscatoria foolias, and want nothing to do with your fake one. As you stumble back to your car in the dark, you have to fight back a strong urge to cry like a baby. You carefully remove the hook from the little brown’s mouth, look up to pick a spot to cast to, and make a couple false casts to get the range down. On the last false cast, you throw the one piscatoria foolia fly that you own into a tree branch 20 feet off the ground behind you. No amount of tugging and shaking will get it loose, and the branch is just high enough that you can’t reach it with your rod tip to try to knock the fly loose that way. So you pull on the line hoping for the best, but the line breaks at the knot you tied a little too quickly. You swear you can hear trout laughing at you behind your back. As you stumble back to your car in the dark, you vow to buy a gross of every fly in your hatch guide, even though your fishing vest already weighs as much as a 1964 Volkswagon Beetle. And I call the fish crazy. November 6, 2010 | Categories: Fly Fishing | Tags: Fly fishing, Nature | Comments Off on Fishes are the craziest critters! Back in the mid sixties, the Michigan DNR was looking for a way to revitalize the fishing on the Great Lakes. The native populations of lake trout and other game species had just about been wiped out by the sea lamprey, an invasive species that had made its way into the great lakes through the Saint Lawrence Seaway. The lampreys are parasites that attach themselves to the fish, then feed on the fish by sucking out the fish’s blood. With the loss of predators like lake trout, the populations of bait fish like alewives, itself an invasive species, exploded to the point where there were massive die offs of the bait fish, as there were too many of them for the food available. This left piles of rotting fish on the beautiful beaches of Lake Michigan in particular, hurting the local tourism industry immensely. The efforts to control the lampreys were working to a large degree, but lake trout are a very slow-growing species, and hard to raise in fish hatcheries. So the DNR had the great idea of planting salmon native to the Pacific Ocean in the Great Lakes to feed on the bait fish, and to provide a fishery for sportsmen. It worked, or at least it seemed to. Coho and chinook(kings) were the two most widely planted species, they grow fast, and are relatively easy to raise in a hatchery. The problem with Pacific salmon is that they only live a couple of years, then they swim up rivers to spawn, then die. They spawn in the fall, and late in the summer and early fall, they go on a feeding frenzy just before they enter the rivers to spawn. This made for great fishing, soon thousands of fishermen from all over the world were coming to Michigan and other Great Lakes States to take advantage of this new-found fishing opportunity. Then the trouble started. Instead of piles of rotting bait fish on the beaches, we had piles of rotting salmon in our rivers. The people who lived along the rivers were not pleased with the stench they had to endure every fall. While the fishing for salmon in the Great Lakes added to our tourism industry, the rotting fish in the rivers subtracted from it. At the time, it was thought that you couldn’t catch salmon in the typical manner once the salmon had entered the rivers. Salmon don’t actively feed once they enter a river to spawn, so the DNR had another great idea, they would allow people to snag the salmon in the rivers. It seemed logical, the fish were going to die anyway, and the DNR didn’t think the salmon spawning in our rivers would be successful anyway, so why not let people harvest them like a crop? That was both a success and an epic fail. Yes, thousands of fishermen descended on the rivers like madmen, ripping the fish out of the water like there was no tomorrow. But, that in itself created an entirely new set of problems. The “standard” tackle for snagging was a huge treble hook with a large lead weight tied or molded to the bottom of the hook. This was cast out and allowed to sink to the bottom, then ripped back by the “fishermen” in a series of jerking motions. The fish schooled up in places there was an obsticle in the river, such as a dam, that prevented them from migrating any further upstream, and the fishermen schooled up in the same places. Soon, the river bottoms were covered in treble hooks, lead weights, and huge balls of fish line, to the point where it became dangerous to any one using the rivers in these places. The DNR also found out that if you allow snagging in some areas for some fish, fishermen would think it was OK to snag any fish, anywhere. The crowds of fishermen were destroying the riverbanks, and trespassing was a huge problem, like never before. There were even fistfights over fish and fouled fishing lines, in short, it was a mess. And, the old saying is true, once you let the Genie out of the bottle, it is darned hard to get it back in. It was the largest known mass outbreak of Big Fish Fever I have ever seen, or hope to see. I don’t know if Big Fish Fever is a disease or an addiction, it has aspects of both, but it is a terrible thing to see when hundreds of people have it all at the same time. It does seem to affect different people in different ways, my dad had it, not to the point of becoming a snagger though, and I have to admit that I have a touch of it myself. After catching a few dozen salmon that weigh over 30 pounds, a 10 inch trout just doesn’t seem to be that big of a thrill anymore. When most fishermen are struck by it, they give up on trying to catch smaller fish, and only fish for the big ones. It takes most of the fun out of fishing, or it does for me. But for some people, it becomes almost a matter of life and death to them, they have to catch the big ones, no matter what it takes. It can be ugly, I have had groups of fishermen threaten me with physical harm when they see that I am fishing to a large fish, they run me off so they can go for it. I have seen guys in trees dropping large rocks in the river, trying to strike the fish with the rocks. People will risk life and limb for a large fish, in fact, many have drowned in their efforts to get a big fish. As I said, my dad had it, I didn’t realize what it was or how badly he had it until I was much older. He used to take us kids out fishing with worms and bobbers for panfish like bluegills, but I knew he didn’t really enjoy it. As I got older, it dawned on me that he only fished in places and in ways as to try to catch the largest fish he could, and as a result, often caught nothing. That’s the way it is when some one has a really bad case of Big Fish Fever, it clouds their judgement, and often they are the most unhappy fishermen to be found. And, just as often, they are fishermen that don’t catch anything, as it was with my dad. Some guys do get the Big Fish Fever and are successful at catching large fish on a regular basis, but they are few and far between. I have known guys to spend all their money and end up divorced because they spend every free minute they have chasing the big ones. Maybe I was one of the lucky ones who only got a mild case of Big Fish Fever. To begin with, I found the thought of snagging fish to be repulsive in the first place. Growing up in a family of sportsmen, I was taught that it was the challenge and the chase that mattered, not the kill. Watching the snaggers in action only confirmed my belief that I wanted no part of it. Watching those guys standing shoulder to shoulder, yelling and cussing each other out when their lines got tangled together, and seeing that they were “hung up” on the bottom more than they were “fishing” all made it a big turn off to me. Another lucky thing happened about that time, Spud was hired in where I worked to be my assistant. Spud and his girlfriend, later his wife, had just moved to Grand Rapids so that she could attend Kendall Art College. He was also going to school as well, but part-time, and working full-time until Chris finished at Kendall. Spud was one of the few fishermen in Michigan who seemed to know that you could catch salmon in the rivers without resorting to snagging. He and I started fishing together, we fished the rivers where snagging wasn’t allowed, or at least it wasn’t legal. 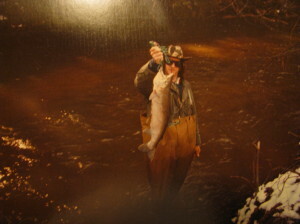 We ran into many a snagger in those days, it was a huge mistake for the DNR to have ever allowed any snagging anywhere. We would often see the local CO (Conservation Officer) standing back in the woods along the Rogue River with a pair of binoculars, watching people fish. When he saw some one keep a foul hooked (Snagged) fish, he would pounce and write them a ticket. It didn’t stop the snaggers, some of whom would harvest the eggs from the female salmon so they could sell it as bait. They would gut the fish right there in the river, keep the eggs, and leave the rest of the fish to rot on the bank. A few people made a lot of money that way, and made conditions on and in the rivers that much worse for the rest of us. What always befuddled me was, Spud and I caught fish, lots of fish, and the snaggers seldom connected. We would be walking out with 2 or 3 fish apiece, and the snaggers would be all over us wanting to know where and how we got them, as they weren’t getting any. We never told them where, only how, but they still continued snagging rather than switch to legal methods that worked. Never could figure that out. I don’t think they believed us, but even when they saw us land legally hooked fish, they would claim it was all luck, and that you couldn’t catch salmon consistently like that. Even when they saw us add that fish to a stringer full of fish, they didn’t believe us. Big Fish Fever does cloud people’s mind. For the record, Spud and I did foul hook a lot of salmon over the years, it comes from fishing schools of large fish packed into small areas, and the fish milling about all the time. 99% of the time, as soon as we knew the fish was foul hooked, we would break it off, often catching the same fish legally later on and retrieving the lure we had broken off earlier. Every once in a while we would land one we thought was fair hooked only to find we were wrong, those fish were released immediately. Even less often, we would land one that was fouled hooked just to get our lure back, but I can only think of one or two times we did that. I did have a mild case of Big Fish Fever, I lived for Steelhead and salmon seasons, fishing for smaller fish, like trout, was only filling time until the “real” fishing started. I guess it is understandable, like I said earlier, after catching 30 pound salmon or 8 pound steelhead, catching panfish and small trout aren’t nearly as much of a thrill. Unlike my dad, and others, who had a much worse case than I did, I continued fishing for the little ones. For one thing, I caught enough big trout while trout fishing to satisfy my case of Big Fish Fever, and I like panfishing for reasons other than just the fish. Sitting in a boat on a lake with a buddy or two on a nice day is still a great way to spend a day in my opinion, and I catch a lot of them, maybe not big, but numbers make up for size. Then a couple of things happened around the same time that I thought had cured me of Big Fish Fever forever. One was that Spud moved out of the area, and we seldom got the chance to fish together any more. Chris had finished her schooling and landed a job in Lansing, that also fit well with Spud continuing on for his degree at MSU. The state also finally got around to banning snagging, something it should never had allowed in the first place, it was like trying to put the genie back in the bottle. Banning it didn’t stop it, and the DNR really cracked down on it where it had been most prevalent before. The snaggers didn’t stop snagging, they spread out over every river there were salmon or steelhead in. The final straw, that I thought had cured me, was my annual fall salmon fishing trip. It was a disaster, everywhere I went, the snaggers were out in full force. I would start fishing, and gangs of 3 to 6 of them would crowd me out. I walked around a bend and saw 2 or 3 snaggers in action, with another of them up in a tree directing the ones doing the snagging. I walked around another bend, and there were two of them in a tree with large rocks, chucking the rocks at the fish in hopes of killing them, anything to be able to take home a big fish. The fish that were in the river were so spooky from being attacked everywhere they went that you couldn’t really fish for them. I walked back into the most remote place I knew of where there would be fish, and found a small school on the other side of the river. As I was making my first cast, the entire school took off for parts unknown, before my little spinner even hit the water. They were so spooked, the little number 2 Mepps I was using was enough to scare them off while it was still in the air. I told myself that “that was it”, I was never going to be part of that zoo anymore. I took my rod apart, walked back to my truck, vowing never to go steelhead or salmon fishing again. Maybe I was spoiled, for years, Spud and I had large stretches of rivers almost to ourselves, with just a few other real fishermen that we saw once in a while. It was no fun anymore, so for years, I lived up to my vow, and I thought my case of Big Fish Fever had been cured. That changed a couple of years ago. I took Larri trout fishing on the Pere Marquette towards the end of September. It had been so many years since I had done any salmon fishing, it didn’t dawn on me that we would run into salmon on our trip, but we did. I have to tell you that seeing dozens of big salmon swimming around brought it all back! I was going to tough it out, not fish for them, not give into Big Fish Fever, but after a couple of hours of not catching any trout, I caved. I cut off the little trout fly I had been fishing with, tied on a big gaudy streamer, added a couple of split shot to the line, and started in fishing for salmon. As soon as I had the first one on, there was no going back, I realized the addiction was as strong as ever! I didn’t land that fish, or any fish that day, my trout rod couldn’t handle fish the size of salmon, but that didn’t stop me from trying. So, I have decided that Big Fish Fever is an addiction I am going to have for the rest of my life. I have been salmon fishing a couple of times since that day with Larri, and steelheading a couple of times as well. But this time, I am not going to let it run my life as it used to, for one thing, it is a lot of work, even more than I remembered. And, I don’t want it to interfere with how much I enjoy trout fishing like it did in the past. This fall when I was up in the Pigeon River Country, I fished a stretch of the Pigeon that I knew wasn’t going to produce any large trout because of a fish kill that happened a couple of years ago. It was still one of the most enjoyable days on the river I have had in some time, even though the largest fish I caught only went 12 inches or so. I picked that stretch of river to fish to reconnect with one of my favorite rivers, and to see how well the trout are coming back after the fish kill. A lot has changed over the years, or I should say that I have changed a lot over the years, which will be the subject of a future blog. But anyway, I no longer fish to land the big fish, or the largest number of fish, I fish to get outside on a beautiful river, and if there happens to be salmon or steelhead in the river, I’ll try for them. I think I have a pretty good handle on my case of Big Fish Fever, I guess time will tell.